For the rider looking for the speed of a road bike with the comfort and confidence that comes from a flat bar, there is the Vita. Whether exercising, commuting, or hitting the open road, the Vita fits great out of the box and is versatile, light, fast, and stable. 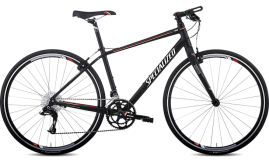 It’s comfortable enough for recreational rides, but still packs enough performance for the occasional event ride or triathlon.